When exploring a new city, do you walk purposefully from location to location, dutifully checking things off on a list as you see them (and almost certainly take a photo)? Or do you just wander aimlessly, soaking up the atmosphere of the place and assuming you’ll probably come across the major points of interest at some point? Both of these approaches have their merits, and it often depends on how much time you have to play with. If you take the time to explore a particular neighbourhood of an exotic city, your area of exploration is more concentrated. This means it’s a pretty safe bet that you’ll see everything that you want to, all while taking a leisurely stroll. 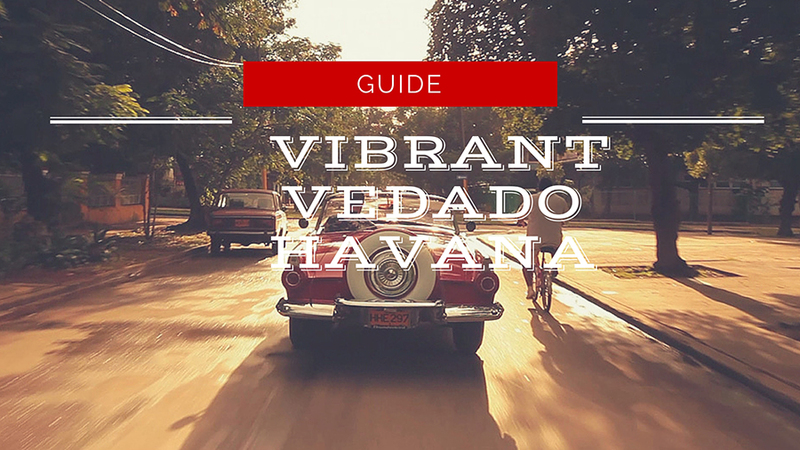 When it comes to vibrant Vedado Havana, what are some of the things you can expect to come across? John Lennon’s music is seen as an expression of hope, which was beautifully demonstrated by the man who played “Imagine” outside the Bataclan concert hall in Paris in November 2015, after so many people tragically lost their lives inside. Even Fidel Castro was a fan of Jon’s music and so a life size statue of Lennon was commissioned and placed upon a bench inside the park, which then had its name changed from Parque Menocal. An inscription next to the statue features lyrics from Lennon’s “Imagine,” translated into Spanish. It seems that Lennon’s message of hope was one that Castro wanted to pass onto his people. The statue is a popular place to have your photo taken in Vedado Havana, although you might notice that John is missing his trademark glasses. These were included in the original statue but were chipped off and stolen. The security guard watching the statue usually has a pair of glasses for the statue, and he will happily position these on the statue for your photo if you want true authenticity. Located on Calle 8, Vedado Havana. The USS Maine was a US Navy vessel that exploded in Havana Harbor on the 15th of February 1898. 266 men died as a result of the sinking, which was either a horrible accident (onboard explosives accidentally detonating) or a bombing, depending on who you believe. The monument to the victims of the disaster was erected in 1925, and was an eagle with its wings outstretched atop a pair of columns. The eagle was damaged in a hurricane in 1926 and was replaced later that year. The monument was severely damaged in 1961 by a small riot that targeted the monument as a representation of the enemy (because the US and Cuba were certainly not friendly at the time). The eagle was torn from its perch. Only the columns remain, but it’s hoped that improved US-Cuban relations will lead to the monuments restoration. It’s still a solemn and moving sight and is a must-see when you visit Vedado Havana. Located on the Malecón/Linea Street. Things were pretty quiet at the US Embassy from 1961 until 2015, since an embassy situated in a country that it did not have formal diplomatic relations with is kind of pointless. Anything officially “diplomatic” that the US needed during this time was largely handled by the Swiss Embassy (thanks Switzerland!). The building became the United States Interests Section in Havana City for a while, which allowed it to operate as a type of de facto embassy. Now it’s back in operation serving its original intended purpose, and it’s rather nice to see that the two countries have put the differences of the past aside. The building itself is rather grim and severe looking, but it’s certainly interesting to see when you’re in Vedado Havana. An embassy on foreign soil represents a sense of fraternity and trust, and the fact that the US and Cuba are once again building this type of relationship gives you the feeling that things in the world are not as bad as they sometimes seem. Located on Calzada, Havana. The presence of the US Embassy was a cause of contention in Vedado, one of the central Havana neighbourhoods. As such, the José Martí Anti-Imperialist Platform was opened in 2000. Essentially a public square, the platform is a place for public gatherings of the pro-government variety. It’s not solely a place to push a government’s agenda, and is also used for concerts. Its official title as a place of anti-imperialism might change in the coming years as the US becomes more of an ally, rather than a symbol of perceived oppression and imperialism. The “Wall of Flags” is a particularly interesting sight. The US Embassy installed an electronic billboard at the top of their building in 2006, while the building was still merely the United States Interest Section. So that the billboard could not be used to broadcast messages that the Cuban government disagreed with, 138 flags (on 20 meter-high flagpoles) were erected to block view of the electronic billboard. See them while you can, as their usage is no longer necessary. Perhaps their days are numbered. The Platform is located directly next to the US Embassy. Vedado Havana is not all symbols of a once-broken international relationship, and after a day of soaking up the history of the area, you need to treat yourself. Be sure to visit Coppelia, which is one of the largest ice cream parlours in the age. Housed in a unique building that has a strange resemblance to a UFO, Coppelia is a true Havana institution. You should get there early, since they often sell out of their popular flavours rather quickly. Located on Calle 23.